After the birth of their fourth child, Khrys Thompson and her partner wanted to lose the baby weight. They signed on with a personal trainer to create an exercise program they could do on their own time, three to four days a week. Their trainer developed a 30-40 minute cardio and strength training session that fit the couple’s work schedule. “We’d use moves like an overhead press combined with a squat to raise our heart rate and incorporate strength training. This cut down total exercise time,” explained Khrys. They also learned how to eat better and control their portion sizes. Using the knowledge gained from their personal trainer, the couple went online and purchased health magazines to incorporate new time-saving exercise routines. Both in the field of physical therapy, Khrys and her partner asked colleagues for exercise tips and gleaned ideas from their teenage kids’ sports training regimens. “It took the thinking out of it for us,” said Khrys. Next, they devoted a workout space in their home, hooked up a DVD player and posted exercise routines on the walls. Ryleigh assumed the role of personal trainer—determining the exercise routines and counting out reps—and developed her love of exercise. Today, Ryleigh competes as a gymnast, the 16-year-old plays volleyball and the 21-year-old is an avid rock climber. The couples’ 18-year-old son easily passed his physical fitness test and acceptance into the U.S. Marine Corps. Initially reluctant, Khrys recently completed her first half marathon (slow and steady) with her 18-year-old son. The family signs up for run/walk events that are kid-friendly. “We especially like events that help other people because it makes us feel a part of something bigger.” The first step, says Khrys, is finding out about an event and showing up. 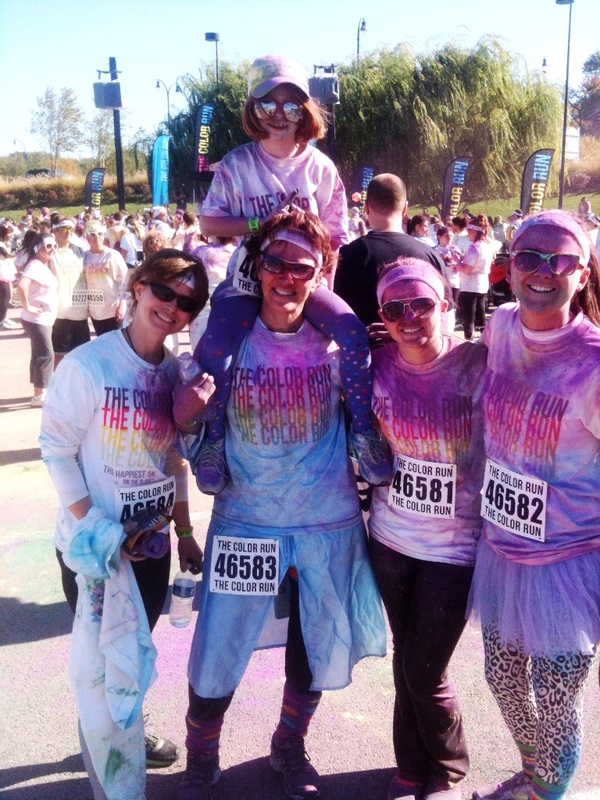 Their favorite events include a warrior dash and a color run where participants are sprayed with colored chalk throughout the race. “We have a blast and take a lot of pictures to commemorate the event,” said Khrys. Khrys admits that sometimes she doesn’t want to exercise, but she’ll put on her workout clothes, stand on the treadmill and soon she’s walking. “You have to commit the time to just do something,” she emphasized. In a world of packed calendars, hectic kid schedules and busy day jobs, this couple has figured out how to make fitness a part of everyday life—and so have their children. “Our kids have grown up with exercise, and I hope they will continue with it into their adulthood,” added Khrys.